Each release of DFSMS builds upon the previous version to provide enhanced storage management, data access, device support, program management, and distributed data access for the z/OS platform in a system-managed storage environment. 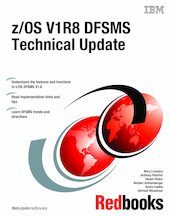 This IBM Redbooks publication provides a technical overview of the functions and enhancements in z/OS V1R8 DFSMS. It provides you with the information that you need to understand and evaluate the content of this DFSMS release, along with practical implementation hints and tips. Also included are enhancements that were made available through an enabling PTF that has been integrated into z/OS DFSMS V1R8. This book was written for storage professionals and system programmers who have experience with the components of DFSMS. It provides sufficient information so that you can start prioritizing the implementation of new functions and evaluating their applicability in your DFSMS environment.